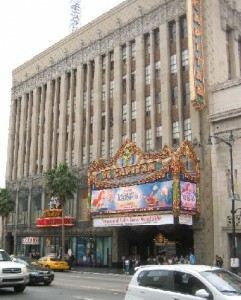 The El Capitan Theater on Hollywood Blvd. 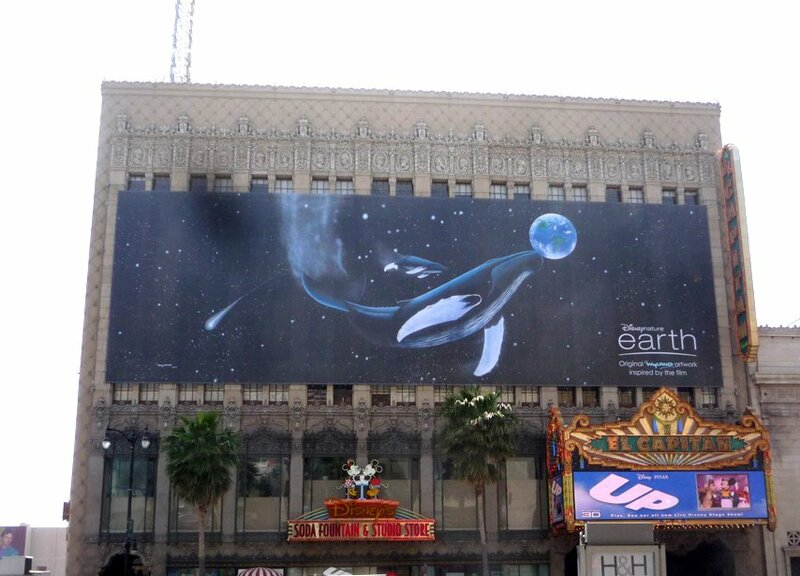 opened in 1926, and was the site of many star-studded events, including the world premiere of “Citizen Kane” in 1941. It later fell on hard times, but in the late Eighties the Walt Disney Co. and Pacific Theaters teamed up to do a complete restoration, and it has since been the venue for premieres of Disney feature films. The theater, built by the same real estate developer who built the Hollywood Roosevelt Hotel and the Chinese Theater, is listed on the National Register of Historic Places. And like the hotel, also a registered historic landmark, the building has been draped with a huge supergraphic sign that obscures much of its architecture. The owners of the hotel, just down the street from the theater, and the sign company, In Plain Sight Media, recently sued the city seeking the right to keep the unpermitted supergraphic sign in place. More on Hollywood Roosevelt Hotel. The owners of the El Capitan theater donated a “conservation easement” to the Los Angeles Conservancy, which is essentially an agreement not to make any exterior modifications to the building that don’t meet historic preservation standards. This easement is considered a charitable donation, and is typically used by owners of historic properties to claim significant tax deductions.